Let’s face it, you don’t have to be an Oxford University graduate to know that satisfied, motivated hospitality employees are productive, loyal employees. The truth is, a positive work environment generates a drive to succeed, knocks down the walls that may exist between front and back of house staff, and helps to encourage employees to put the operation’s success at the forefront of their professional (and sometimes personal) goals. As chef leaders, it’s our responsibility to inspire, educate and motivate staff, not just about producing the finest food possible, but also about the financial and business aspects of the industry. So, how does a chef leader attract and keep good people? And how can they inspire, educate and motivate staff while keeping true to creating great dining experiences and operating a profitable business? Well, we’re great believers in that old adage that we’re all products of our environment, and for us, the key ingredients of that environment are motivation and satisfaction. Motivation – it’s all about attitude! The single most important thing you can do as a leader to create a positive attitude among your staff, is to lead by example and maintain a positive attitude of your own. Employee manuals, orientation classes, role-playing and mission statements all have their usefulness in motivating staff. But their impact will fade with time if the top chef fails to set and maintain the right attitude. 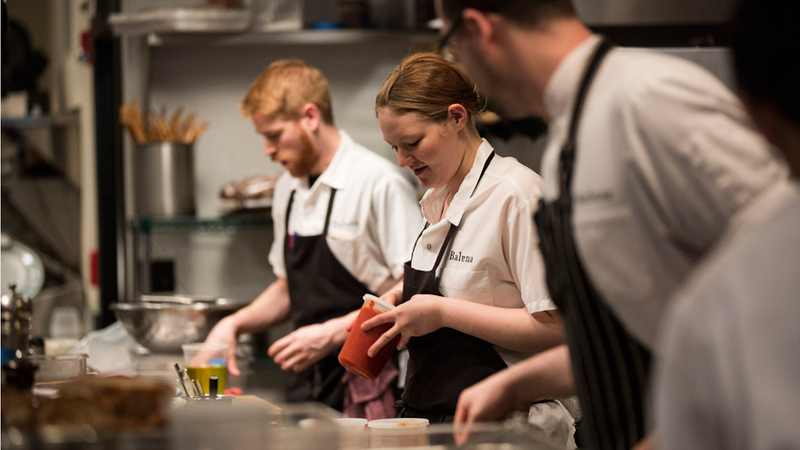 In some way, every employee reflects the attitude of his or her leader and its important that leaders in the kitchen ask themselves if they have it first. After all, it’s very easy to blame failure on ‘others’ not having the right attitude. Many things that happen in kitchens are beyond our control – who called in sick, what piece of equipment suddenly broke down, the traffic ram that delayed an important food delivery. We can however control how we react, and through that example, influence how staff will deal with problems too. A positive influence can create an environment that invites growth, respect, integrity, trust and dignity. Its sounds cliched but having an ‘open door policy’ really is anything but that. In the past, young chefs were expected to absorb the brilliance of their culinary masters in appreciative silence without complaint. Very likely, any novice bold enough to voice a concern would have received a stock answer as a suggested solution ‘If you don’t like it, go work somewhere else.’ Times have changed and with it the expectations (and demands) of people who now work in commercial kitchens. Employees must be allowed to voice their concerns and find you willing to listen and eager to help. Most of the time, a frustrated employee is one who started out with a very simple issue, but never got the opportunity to express his or her feelings. Allowing employees to vent their frustrations (at the appropriate time and in a constructive manner) goes along way towards building a better environment for all the team. As their leader, coach them on finding a solution and help them put that solution into action. Allowing employees to be heard and take part in the resolution process can help affirm their sense of participation and ‘ownership’ in the operation of the kitchen, as well as giving them a better level of overall job satisfaction. There is no good way to break a promise to an employee. We’ve all been in the situation where an employer dangled the carrot of a promotion or pay raise to get us on board, then back-pedaled later with ‘the situation has changed’. Broken or delayed promises can buy an employee’s allegiance for a very short time only. Eventually – and often sooner than later – the allegiance turns to resentment, dissatisfaction and impaired performance. Integrity is as important to kitchen leaders as any CEO , and being as true to our employees as we are to our cuisine is vital for the well being of all brigades. Being honest, keeping your word and not making promises that you know can’t be kept are very basic principles but ones that have remarkable benefits. Include your employees. When you are writing new menus or changing policies, involve the staff. This reaffirms to employees their importance in the process, and also lets you tap into their wealth of knowledge and experience. Your staff are on the front line day in, day out. They can have great ideas about what works and what doesn’t, so listen. Involving team members in the decision-making process improves your chances that they’ll buy into any changes and be more committed to the success of the operation. New policies and menu changes will become part of the culture much quicker when employees know they’ve had a voice in decision-making. At the end of the day, our success as chefs, managers and leaders will be measured on the basis of our employees’ successes and on their daily performance. By helping them better perform their jobs, in an environment that they want to stay and learn in, ultimately makes our own job that much easier. It also, in turn, creates a win-win situation for everyone – the employee, the operation and most importantly, the guests that come to the restaurant.